At the ripe old age of twenty-five, I still get mistaken for an eighteen year old. Flattering? It should be, but somehow it makes me feel a bit self-conscious. I chalk most of this up to my height. At five feet two inches short, most people my age tower over me. So many of my friends are tall, and they wear their heels with pride. I, on the other hand, am caught wearing flats about eighty percent of the time. I love a good heel just as much as the next girl, but there is something about little ballerina shoes that make me feel so gosh darn happy, so light and care-free. I must have been a dancer in a past life. There is nothing more chic (IMO) than a great flat paired with skinny jeans and a jacket. My go-to look! 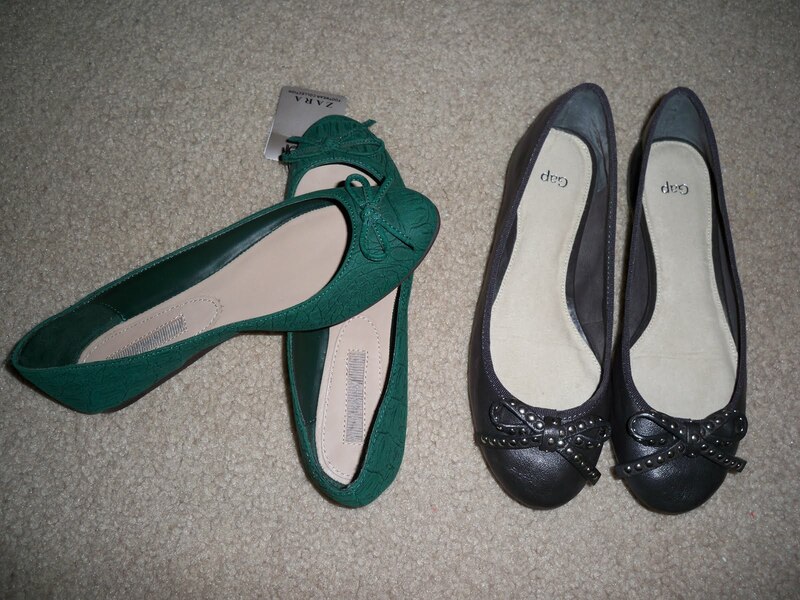 Recently acquired: Emerald green from Zara, Charcoal gray from Gap. It's the last day for the Give and Get coupons, so run out today if you get the chance! And who wouldn't want these on their feet? That's so funny!! i have the same thing happen to me ALL the time. i'm 5'2'', and 24.
i always wear flats, jeans, and hardly any makeup, so i can see why they make that mistake!! I agree everyone wants these beauties on their feet especially the Chanel! I am also saving for the black revas (with the gold TB logo). I love them so much! Cupcake girl: I drool every time I see this picture of the Chanel flats! Veronika: I am debating on what style of the Revas to get! The patent all black ones, the black with the gold, black with silver, metallic? I think I'll try one of each on and then decide! Jessica: I agree, flats are undeniably comfortable. Sometimes you just have to pass on the heels and go for a flat. b_ra: Lol, my bf is tall too! We make quite the pair ;) I have to stand on my tippy-toes to kiss him when I'm not in heels. You understand! I love the look of flats with jeans, it is so chic. I so wish I could pull it off. You're so lucky you can! I love flats, too. I have 5+ pairs in different colors :). I love the Zara pair! Those green ones are SO cute. And I love the Beige and black Chanel. Just bought a few pairs of fun flats! Hey no matter what size, you rock what you got right?! Oh, those Zara ones. Such a gorgeous color. And of course the Torys and those amazing Chanels are absolutely stunning! Natasha: No flats? Oh, you so need a pair in your life! Sydney: My fellow petite girl ♥ Thank you! Kamani: I keep wanting to buy more, I want one in every color! Tamara Nicole: I completely agree! Mimi: I think we just love shoes in general. They can really make or break an outfit! I'm 5' 2" as well :) and I never wear heels. I always buy them, but never wear them. I've only worn those Cynthia Vincent wedges from target once for example! I just feel way more comfortable in flat shoes. I love those ones from the gap! Noelle - how tall are you? You look so slender and tall in your photos I have trouble believing you're petite! I own those tory burch patent flats and I definitely recommend them. The regular leather scuffs up real quickly but the patent holds up well. I wear them to commute to work almost on a daily basis (they probably don't provide much support, which is bad) but are perfect for wearing with black tights in colder weather.